M T D J u n e 2 0 1 8 60 E u r o p e a n N o t e b o o k A lthough at the moment the UK remains part of Europe, the country's attitude toward the benefits of having both winter and summer tires fitted to their vehicles during the course of a year could not be more different than their colleagues in Europe. Unlike their European counterparts, UK drivers just do not see the value in changing their tires from summer into winter tread patterns and back into summer tires, and really the very unpredictable weather conditions throughout the country are the major reason. As the conditions in the winter months are not generally severe and sometimes the number of really hot days can be counted on one hand, drivers see no reason to change their tires. I am aware of the frustration this (some would say) misguided approach causes enterprising UK tire dealers who just cannot con- vince their customers of the benefits of following the lead in Europe where tire storage between the seasons is becoming big business. I recently spoke with a sales manager at a leading tire manufacturer who explained, "UK drivers remain reluctantly hesitant to switch their tires to suit a particular weather season and we have so far failed to convince and educate our customers about how important it is to have the correct compounds fitted when driving in differing weather conditions. "Even now the UK tire industry as a whole continues to promote the well-worn message that it isn't just about driving on snow, but the precise way that rubber performs in low temperatures and on a cold, rainy day, drivers just do not realize that the rubber compound of a summer tire will never perform as well because of the difference in the compound," he said. "For example, on a typical winter day in average cold condi- tions there will be around a 10% to 20% improvement in stopping distances with cold climate tires fitted to a vehicle, which can make a huge difference to life or death in an accident." It is also interesting to note that enterprising retail operations have over the past couple of years introduced a "tire hotel" service to store drivers' summer and winter tire between seasons, which has been established in Europe for a number of years now. However, this gesture has mainly fallen on deaf ears as many motorists mistakenly believe it to be a gimmick to just sell more tires. is totally "blinkered" attitude to winter and summer tires in the UK is why the market has tried so hard in the past few years to introduce and market all-season tires as a positive alternative to winter and summer tires. 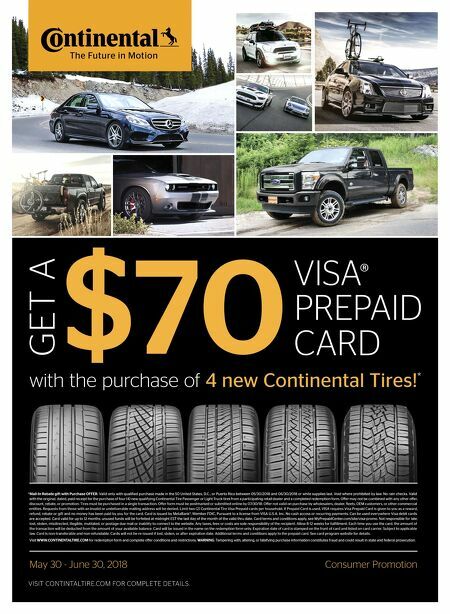 I have noticed that a growing amount of manufacturers, wholesaler/distributors and retailers are increasing promoting their stocks of all-season brands with a message that all-season tires have exactly the same markings as winter tires giving them a high standard of grip while the tread patterns are also suitable for summer tire driving. 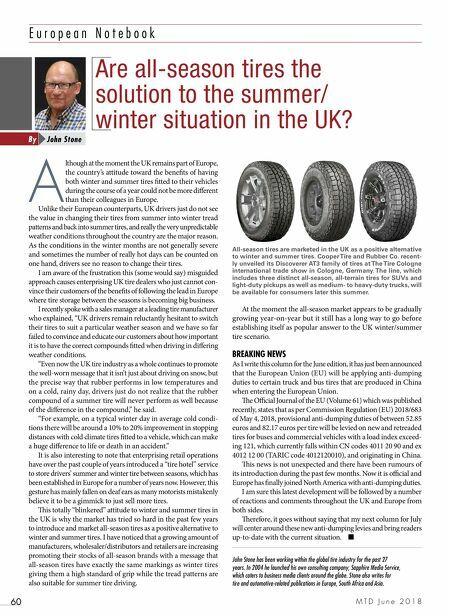 At the moment the all-season market appears to be gradually growing year-on-year but it still has a long way to go before establishing itself as popular answer to the UK winter/summer tire scenario. BREAKING NEWS As I write this column for the June edition, it has just been announced that the European Union (EU) will be applying anti-dumping duties to certain truck and bus tires that are produced in China when entering the European Union. e Official Journal of the EU (Volume 61) which was published recently, states that as per Commission Regulation (EU) 2018/683 of May 4, 2018, provisional anti-dumping duties of between 52.85 euros and 82.17 euros per tire will be levied on new and retreaded tires for buses and commercial vehicles with a load index exceed- ing 121, which currently falls within CN codes 4011 20 90 and ex 4012 12 00 (TARIC code 4012120010), and originating in China. is news is not unexpected and there have been rumours of its introduction during the past few months. Now it is official and Europe has finally joined North America with anti-dumping duties. I am sure this latest development will be followed by a number of reactions and comments throughout the UK and Europe from both sides. erefore, it goes without saying that my next column for July will center around these new anti-dumping levies and bring readers up-to-date with the current situation. ■ John Stone has been working within the global tire industry for the past 27 years. In 2004 he launched his own consulting company, Sapphire Media Service, which caters to business media clients around the globe. Stone also writes for tire and automotive-related publications in Europe, South Africa and Asia. Are all-season tires the solution to the summer/ winter situation in the UK? John Stone By All-season tires are marketed in the UK as a positive alternative to winter and summer tires. Cooper Tire and Rubber Co. recent- ly unveiled its Discoverer AT3 family of tires at The Tire Cologne international trade show in Cologne, Germany. The line, which includes three distinct all-season, all-terrain tires for SUVs and light-duty pickups as well as medium- to heavy-duty trucks, will be available for consumers later this summer.